All-in-One Social Popup is a plugin for WordPress that allows you to add a highly customizable social popup box to your blog or website. It combines 7 different popups (on page load, on external link click, on copy content, on context menu, on scroll down, on idle, on click), which can be used separetely or simultaneously without conflicts. Once raised, popup asks visitors to like webpage on Facebook, +1 on Google, share on Twitter or LinkedId. Popup box is configured through settings page. Google, Facebook, Twitter and LinkedIn are in TOP10 most visited websites in the World. All together they have over 1.2 billions of registered users. Could you imagine more successful spots to promote your website? All-in-One Social Popup plugin will help to get more organic traffic from Google Search and add thousands of fans on Facebook, Google Plus, Twitter and LinkedIn. More fans is more traffic. 7 social popups in one plugin: use them separetely or simultaneously without conflicts. OnPageLoad popup appears once user open page in browser. OnClickExternalLink popup appears once user click any external link on page. OnCopyContent popup appears once user copy part of your page into clipboard (using Ctrl+C or through context menu). OnScrollDown popup appears once user scroll down current page to particular point. OnIdle popup appears after defined period of inactivity. OnContextMenu popup appears once user call context menu (click right mouse button). OnClick popup appears once user click on link with class="megasocialpopup_click" or class="megasocialpopup" attribute. Remember visitors: popups can be displayed only once per visit/session. This option is configured on settings page and available for OnPageLoad and OnScrollDown popups. If it is enabled, appropriate popup appears only one time per session. It will not annoy your visitors until they close browser. When you open demo page, you will see OnPageLoad popup. Then you can click external link #1 or external link #2 under “Demo” section and you will see OnClickExternalLink popup. Try to copy any part of content into clipboard and you will see OnCopyContent popup. Scroll down this page and you will see OnScrollDown popup. Do not touch mouse, keyboard or screen for 30 seconds and you will see OnIdle popup. Click right mouse button and you will see OnContextMenu popup. At the end you can click another demo link under “Demo” section and see OnClick popup. 1. Install and activate the plugin. Once activated, it creates menu item “All-in-One Social Popup” under menu section “Settings” in left side column in the admin area. 2. Click left side menu “Settings >>> All-in-One Social Popup” and do required settings. Set display mode, colors, size, content, etc. Please look at the screenshot to see what kind of settings you can do there. 3. 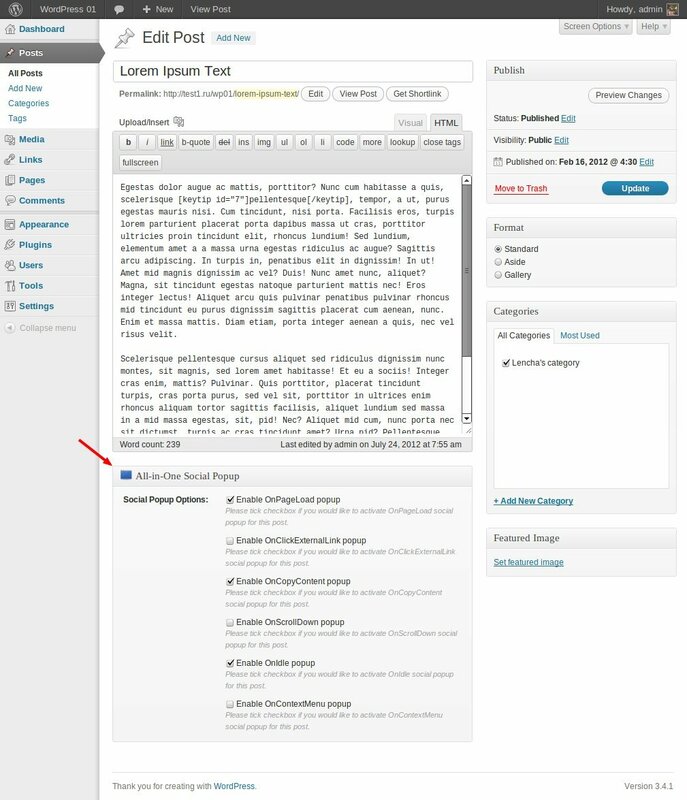 If you selected “Homepage and selected posts/pages” or “Selected posts/pages” display mode on settings page, then you can assign particular posts/pages to be covered by plugin functionality. Go to post/page editor and set checkboxes “All-in-One Social Popup” (view screenshot). If you have problems regarding using the plugin, please contcat me and I’ll help you.